I’ve lost count of how many times I asked Morpheus Rising’s Pete Harwood when their second album would be released but it I probably did so every time I saw them live after (and possibly including) the launch gig for Let The Sleeper Awake, which made my top-ten albums for 2011. I probably mentioned it a few times on social media as well. So back in September, when the band announced that a Kickstarter campaign had been opened to help fund the new release, I pledged straight away. The fans did their stuff and the initial target was comfortably passed, leading to anticipation of the release. Delays meant that the original release date of December passed without seeing the album, although those who had pledged were invited to download an advance copy. I did, listened to it and enjoyed it but then, still not being a big fan of playing music through my laptop, filed it away and waited for my physical copy, which turned up yesterday. Behind a stunning Dylan Thompson cover, comes an album that builds on the previous release. Where the prevalent theme of Let The Sleeper Awake could be said to have been Fantasy, with the majority of lyrics on that album being written by previous vocalist Graeme Tennick, Eximius Humanus (Latin for Super Human) takes a turn towards more Science Fictional aspects, with all lyrics written by current frontman Simon Wright. The album opens with the almost-title track, Super Human, a short affair which starts off more electronica than rock but which, both musically and vocally builds to a crescendo that leads straight into Looking For Life, where the rock kicks in. A crunching guitar riff, power drums and cries of “Yeah, yeah, yeah” make way for a “twangy” guitar line behind Si’s vocals, telling the story of astronauts lost in space. The NWOBHM influences are once again clear, the twin guitar work changing for each section of the six-plus minute song, flowing around the vocals and never overpowering them. Day Number One is quieter, kicking off with an echoing, atmospheric riff before the second guitar, Andy Smith’s bass and Nigel Durham’s drums come in. Si’s vocals, almost gravelly in places, soar during the choruses, and seem to be layered throughout the song to give it a fuller sound. Of course, there is the inevitable and well-placed, almost minimal, instrumental section but it is the vocals that make this my favourite track on the album. The first time I heard Mega City One, when it was released as a teaser for the album, I thought it a bit cheesy, but it is increasingly growing on me. Based on a certain well-known comic character (not mentioned by name, presumably to avoid copyright issues), it is the heaviest track on the album. The guitar work is generally raw, with a short screaming solo and you can almost picture Nigel beating down on the drums at the back. Then it is back to the atmospherics for Fly Higher, with cymbals breaking like waves over the guitars bookending the heavier rock sound of the main body of the track. Snippets of the lyrics may remind me of Muse’s Uprising, but the delivery is more Bruce Dickinson than Matthew Bellamy. Say Something dispenses with the quiet opening and explodes straight into life as the final sounds of the previous track fade away. In places the guitars take second place to the rhythm section, giving the vocals room to breathe and coming in between lines. In others, they come to the fore, and allow the incredible work of Pete Harwood and Damien Sweeting to be heard unencumbered. I am still trying to work out what the enigmatic lyrics to Bending Light are about but that doesn’t detract from the track’s obvious qualities as a venue rocker, the title repeated often enough that it seems inevitable that audiences will be encouraged to shout it back at the stage during performances, while the middle instrumental section is long enough for them to go wild during. The drums during the opening to Rising are incredible, with Nigel at times getting a sound like he is bashing two metal dustbin lids together and making it work. Unfortunately it is a mixed bag of a track which doesn’t really seem to know where it is going. “We’re Rising” sings Si, his vocals doing just that before a short metal-rap section which, I’m afraid, does nothing for me but evoke images of, for some reason, The Beastie Boys. The track is almost saved by another impressive twin guitar section but the vocals immediately afterwards come across as strained. Touch The Sky opens in similar way to Looking For Life but with some of the wordless vocals being carried into the body of the song. Inspirational lyrics implore you not to waste your life and reach for the seemingly impossible but it is the superb instrumental section of the track that draws you in. The album ends on a once again heavier note with Superpower, the guitars alternating between crunching riffs and intricate solos and Si’s vocals switching between almost snarling and once again soaring. With one dodgy track and another which is still growing on me, Eximius Humanus is not a perfect album. It is, however, a very good one and one which I suspect will be featuring in my top ten at the end of the year. 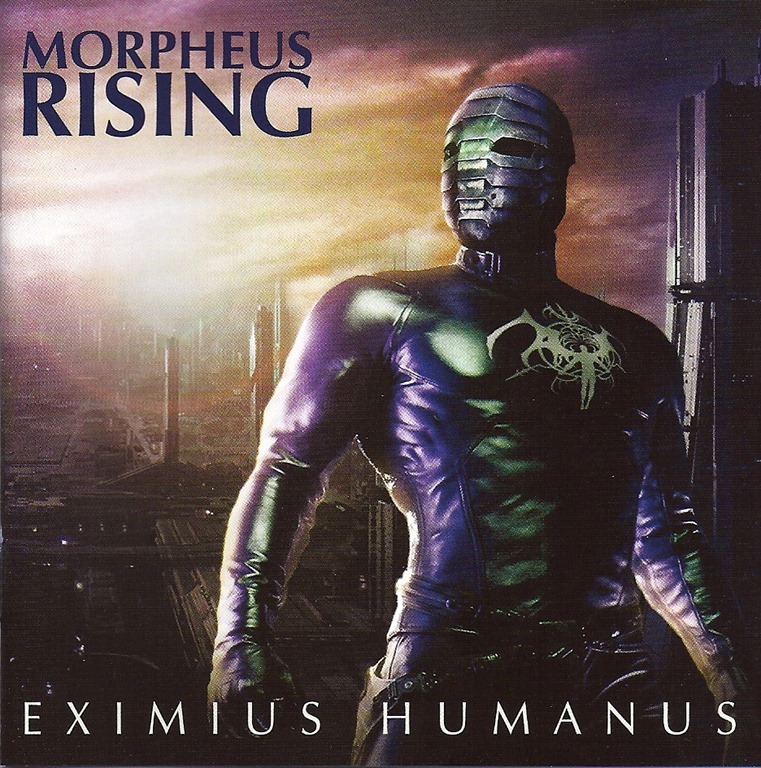 This entry was posted in CD Review and tagged Morpheus Rising. Bookmark the permalink.